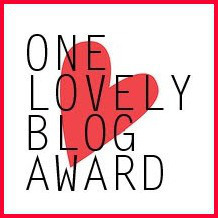 Well what do you know… I’ve been nominated for The One Lovely Blog Award. How about that? You really need to check out her blog and her fresh and unique perspective. Good stuff! So, the following rules apply for this award… sounds simple, right? Nominate those you feel are deserving of the award. 1- I’ve been writing (mostly poetry) since I was about 13. Have written many books, published a few. 2- I’ve been playing drums for over 40 years… (wow – I don’t feel that old!) and have done a little road and studio work to-boot. 3- I lived the life of a Colorado Mountain Man for a while – lived in general isolation on the north fork of the South Platte River near Foxton, Co – limited to wood heat, outhouse toilet, 6 gallons of hot water, a summer seasonal well, and a 4 party party-line. During that time my wife and I home birthed 3 children, ate lots of rainbow trout, and lived a life of Colorado Mountain discipline. 4- I have 5 kids between my wife (the love of my life) and I, with 3 grandkids and an ever extending family. 5- My family heritage is from southern Kentucky with history and representation in the Union’s 9th Infantry of Kentucky during the civil war. 6- I love a good cigar! 7- I love being on the road, on my H-D Heritage, with nothing but the Open Road in front of me. Okay – now for nominations of those blogs I follow that I think are amazing and deserve to be recipients of The One Lovely Blog Award: Please take the time to check out the great work done by these amazing writers, photographers and living-world journalists! Thanks to all of those who follow my blog. I appreciate your sincere comments and kind words. Please let me know if there is anything that any of you would like to see or hear from me. I’d love nothing more than to be inspired by those of you out here, to embark on an unexpected project. Interesting life youv’e lived in the mountains of Colorado. Sounds cool, close to nature and it seems from your description that it was off the grid. Thank for nominating me, much appreciated. You’re so very welcome. Your perspectives, your poetry, and all – are very inspiring and always a welcome greeting when I see you’ve posted something new. I’m most intrigued by number three, what an experience that must’ve been. I’m sure there were tough times too but it sounds idyllic to me! Congrats! And thanks so much for sharing the award with us! Hope some day you will share photos with us as well 🙂 Your photography and stories are wonderful! By the way, although our format does not allow for answering questions and giving awards, we did link to your site from our Facebook page! Take good care.